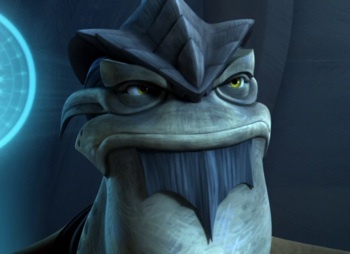 In retrospect, I can see why the writers decided to have a number of relatively lighter stories in a row to precede this one, because the often harrowingly intense (a phrase I never expected to use to describe a Star Wars cartoon) Krell arc is The Clone Wars at its darkest and most powerful, and all the more so because it isn’t one of the series’ sweepingly epic, mythologically-based stories but rather one that centers on war and corruption, confronting the philosophical/moral dilemma of whether or not to follow orders that one knows in one’s heart are wrong when the very act of disobedience is considered wrong by those in charge, and in the process, continuing to explore the Clones as people, not simply manufactured soldiers, as well as to expose the rot at the heart of the Republic. From the start of this 4-part arc (episodes 4.07-4.10), we’re thrown deliberately off-guard, instantly indicating this won’t be the average Clone Wars tale. The Republic troops are fighting on a planet unlike any we’ve seen before–it’s a world of perpetual darkness, in which Anakin and the Clones can barely see a few inches in front of their faces and in which not only the Separatists but the very terrain and even plant life are killing them off. For example, the planet is full of carefully hidden creatures that seem to be Venus fly traps crossed with the Sarlaac pit monster from Return of the Jedi, all dangerous tentacles and chomping teeth. For nearly the first half of the first episode, we witness an absolutely devastating and completely disorienting battle, and to greater increase the intensity and verisimilitude of the situation, it is also the rare Star Wars battle where we can clearly see that many of the enemies being fought are humanoid, organic people rather than simple droids. And then the rug is pulled out from under us again when a huge, imposing Jedi Master who we’ve never met before, Pong Krell, arrives to tell Anakin that Chancellor Palpatine has requested that he return to Coruscant immediately and that Krell will be taking over for him. As jarring as this is for both Anakin and the viewers, it isn’t nearly as jarring as Krell’s treatment of the Clones. Whereas Anakin, along with most other Jedi who we’ve previously met, have handled them with the dignity and respect deserving of men who have literally been born to lay down their lives for the Republic, and also that which all people deserve, period, Krell instantly seems to think of them as tools to be used and disposed with at his discretion, in order to advance his military plans. Although he is aware that the Clones have given each other names, he refuses to acknowledge them as distinct people with separate personalities and identities, dehumanizing them by referring to them only by their call numbers. Furthermore, he sends them marching blindly into hostile territory, where the enemies have every advantage, completely disregarding Rex and the other mens’ repeated misgivings and pleas to allow them to either scout ahead or attack from less exposed positions. Krell demands that his ends be achieved exactly as he dictates them, regardless of how many men have to die in order to bring him glory. And that number is frighteningly high. Moments before, we had seen Anakin speaking warmly with Rex. To see this man, who we have become very fond of over the course of the series, immediately afterwards treated as if he is a tin soldier by an arrogant, seemingly heartless general is infuriating, and that anger in the viewer only grows as the arc proceeds, and deliberately so. Time and again, Krell demands actions that put Rex’s men at unnecessary risk, berating them when they even so much as attempt to fall back from being helplessly slaughtered, and taking full credit whenever a victory is actually achieved. In the second episode, he orders Rex to not allow two of his men–Fives (the last surviving member of the Domino Squad) and Hardcase–to attempt to go ahead, sneak into enemy territory and commandeer two of the enemy’s ships, in order to turn their own fire on them, disbelieving that a Clone would be capable of such a tricky maneuver, and yet even when they do accomplish this, he refuses to praise them. In the third episode, “Plan of Dissent,” this gets even worse, when he flat-out refuses to allow them to try to pilot the ships against the Separatists, even though it’s the only effective strategy they could possibly use against them. 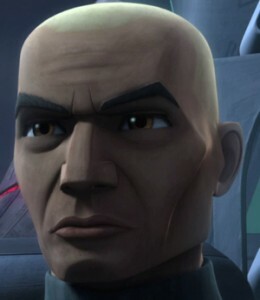 Rex is caught in a terrible position, because he has always been a loyal soldier, but never before has he been handed orders by a military superior that he knows are morally wrong, and to make matters worse, he can’t contact any other military superiors, such as General Kenobi, because all communications are down. 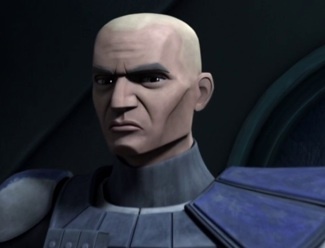 Since the start, Rex has always been one of the most fascinating and fleshed-out Clones, and arguably the one with the most fully developed character arc, thanks to episodes such as his first appearance, “The Hidden Enemy,” in which he has to help expose a traitor Clone who believes the Republic is using his brothers as their slaves, and “The Deserter,” in which he discovers a “traitor” of a different sort–not one who ever outwardly turned on the Republic but who simply decided to leave it. Through that encounter, he learned that one doesn’t have to be a soldier in order to be noble. Deserting was never an option for Rex. It isn’t who he is. But he did learn to respect the idea that the soldiering life might not be right for all Clones. And here, the ideals he was instilled with from birth are called into question as they have never been before, and over the course of this 4-part episode, he gradually goes from reluctantly doing what he is told to do, to allowing others to disregard Krell’s orders, to, finally, refusing to take Krell’s indignities, abuses, and–as it turns out–treason any more.